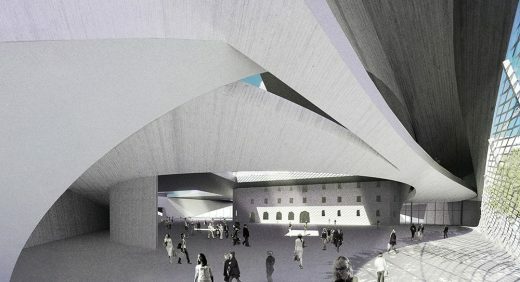 The new extension of the Kulture Magasinet building in Sundsvall will occupy a beautiful location between the two hills that enclose the city, and that faces the Selangeran River. 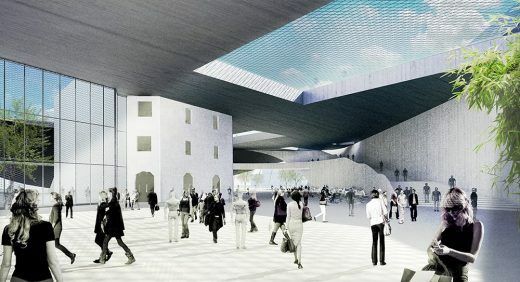 It will create a lively meeting place along the waterfront for residents and visitors, all alongside an imposing group of warehouses that are the symbolic remains of a long tradition of shipping and trading. The continued expansion and prosperity of the city, presents the opportunity to create an appropriate setting for these important structures and to reinforce the role of the Kultur Magasinet with the new theatres and performance spaces. The relocation of the E4 highway to the east consolidates the site to the west and provides the width to create a physical barrier to the traffic noise. Equally important is the view from passing vehicles on the E4 highway, an important gateway into the city. This view requires visual and functional cohesion. 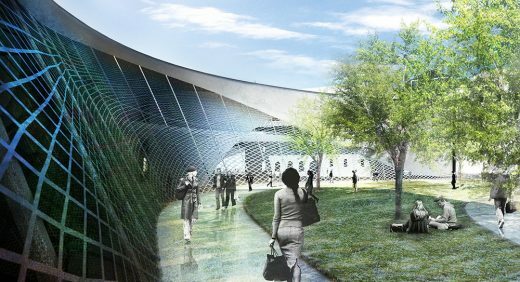 The new complex has a powerful architectural identity that will give the building a landmark status. A horizontal structural grid in the form of a hexagonal mesh is overlaid on the site, acting both as datum level and as design language. 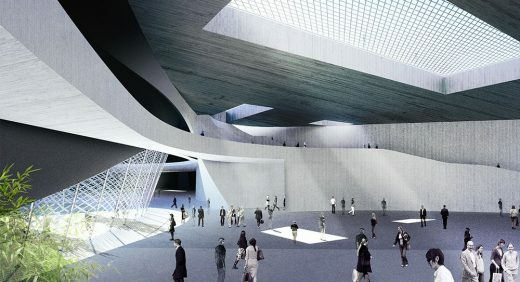 The fluid forms of the three new auditoria are built within the voids of the mesh. It is this mesh that gives an identity to the complex, not only as the principal structural, but also on a smaller scale, as a brise soleil to the glazed facades. The existing Kulture Magasinet will be accessed from the new central foyer along its eastern façade. The three new auditoria all connect to the foyer as a ‘string of pearls. These in turn separate the public spaces from the serviced areas to the east. These ancillary ‘back of house’ spaces are set behind a meandering ‘rock face’, where openings provide access for deliveries and underground parking. 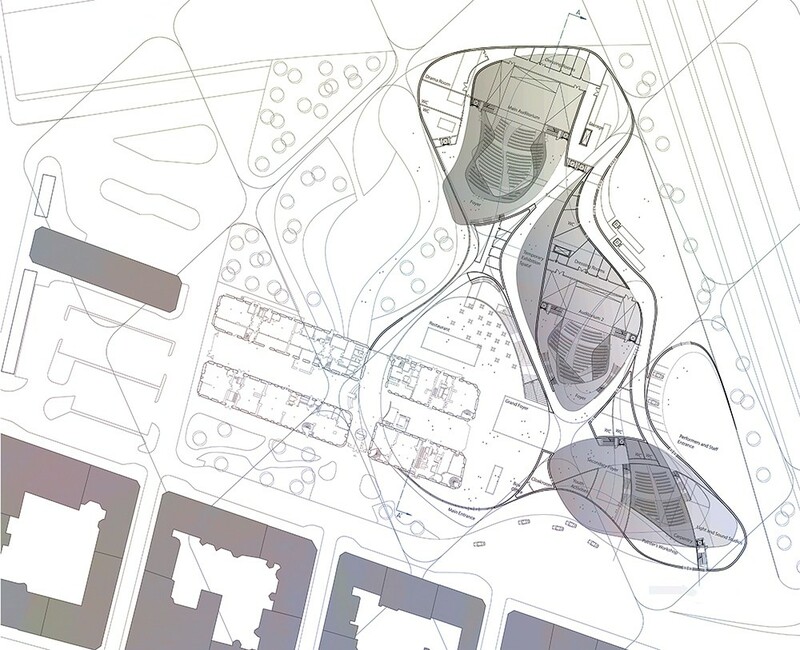 The working side of the complex is as important as the public face, and is clearly visible in this prominent location. Principal materials are sourced locally. Internal surfaces are faced in stone and the same material is carried through to the outside public areas as paving, river walls and benches. The familiar material is used in all civic areas and reinforces the links with the old town. The envelope above is clad in standing seam aluminium sheet that celebrates Sundsvall as the major producer of Swedish aluminium. It acts as an emblem for the modern city. The quality of the material responds to the fluid forms, and laid in a linear pattern it reflects and illuminates the water. Glazed areas are protected from solar gain by the expanded aluminium mesh, acting as a brise soleil that maintains the apparently seamless envelope and replicates the hexagonal structural grid. Generous landscaping includes for a tree planting programme along the waterfront, forming a glade of trees that protects the public open space, and the transformation of the highway into a tree-lined boulevard.